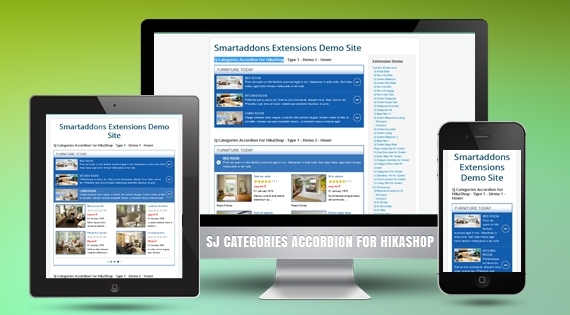 SJ Categories Accordion for HikaShop powered by the best features designed for product showcasing, supports HikaShop component and Joomla 3.x. Highlighting your frontpage to attract more visitors is likely to be effective with this module. Take a look at demonstration, you'll be impressed by clear and modern layout along with professional arrangement of categories and items in them. At first sight, you can see the name of main category, sub-categories and items include preview images, title, star rating, price, created date and brief description within a single area of module. Besides, you can be able to decide on which you want to display or hide such as small images and description of categories or item's ratings, created date, etc. With support of 2 tab event types (Hover and Click), items' description in each category will spread out automatically if you use Hover. But for Click, you have to use mousewheel clicking into navigation button in order to see more hidden items. With responsive layout, this module can fit all device screen sizes. You can either display price detail, add to cart or add to wishlist button for websites selling products and other types of webpage. 2. Fully compatible with IE8+, Firefox 2+, Flock 0.7+, Netscape, Safari, Opera 9.5, Chrome. 21. Add note for the module in some cases.